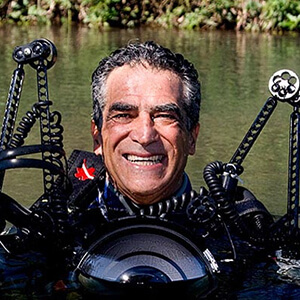 Amos, one of the world’s foremost underwater photographers, has led National Geographic expedition teams with Dr. Eugenie Clark, Dr. Sylvia Earle, astronaut Buzz Aldrin, and Dr. Alex Antoniou, and has co-produced documentaries with Stan Waterman. His photos and essays have appeared in more than 500 publications in North America, Europe, and Japan. Amos co-founded Israel’s Marine National Park on the Red Sea. His cutting-edge adventure-travel program BigAnimals provides divers with opportunities to observe, photograph, and interact with the most magnificent inhabitants of the sea: white sharks, orcas, dophins, sailfish and blue, sperm and humpback whales.